For the exploration and the later exploitation of shale gas plays and other unconventional hydrocarbon reservoirs the understanding of the source rock and their geochemistry is of major importance. Geochemistry is the main source to be able to detect unconventional plays, as well as of major importance for the evaluation of the quality and the future development of these plays. are not focused in well defined reservoir sands but occur disseminated in the rock fabric. do not flow to the well bore, but have to be liberated from the rock through fracing. However, in regard to gas formation, the rules of gas formation are the same as those of conventional gas formation, i.e. the temperature-driven transformation of organic matter to oil and gas. These special conditions of occurrence make gas geochemical techniques, in particular gas isotope techniques a crucial technology for gas exploration and production. Generally, the local geology is well known and possible target rocks are known and geological mapped. Even though the rocks are known, the possible potential of in-situ gas content and further petrophysical and petrochemical parameters are unknown or at least less known. To classify the potential it is imperative to carry out core data collection and analyses beside other analytics. Those are needed during the pilot program phase and early development phase. To determine the above-mentioned parameters the following on-site (field-) services and laboratory services should be taken into account. 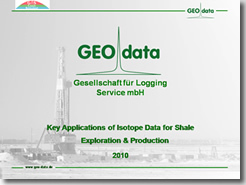 Special emphasize has to be laid on gas sampling and isotopic compound analytics as well as desorption directly after coring, because the only chance to gather those data more or less undisturbed and without major influences is during the drilling/coring operations, when the rock is drilled and initially releases its gas content. All later logging and wireline sampling will not have the same quality as the “first” fingerprints gathered during drilling.